With August done and dusted it’s nearing the end of summer, which means now is the perfect time to start transitioning menus to more autumnal flavours. We are on hand to bring you the latest edition of our fabulous new autumn/winter Drinking Thinking™ brochure. Not only is it jam packed with recipe inspiration for the colder temperatures, it also includes exciting new products to be released over the coming months. These will include Zuma Organic Turmeric Chai, Zuma Direct Peruvian Hot Chocolate, Sugar-free Gingerbread Syrup from Sweetbird, along with drinks toppings and limited edition festive cups. 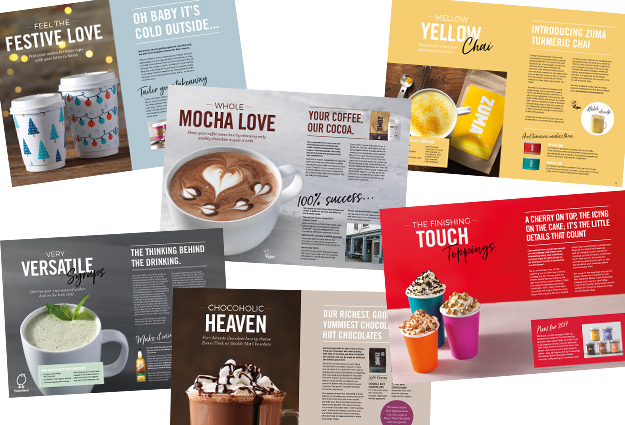 Get ready to bring back those rich hot chocolates, relaxing chai lattes and a selection of new seasonal specials that will get those sales booming and see you through to spring. 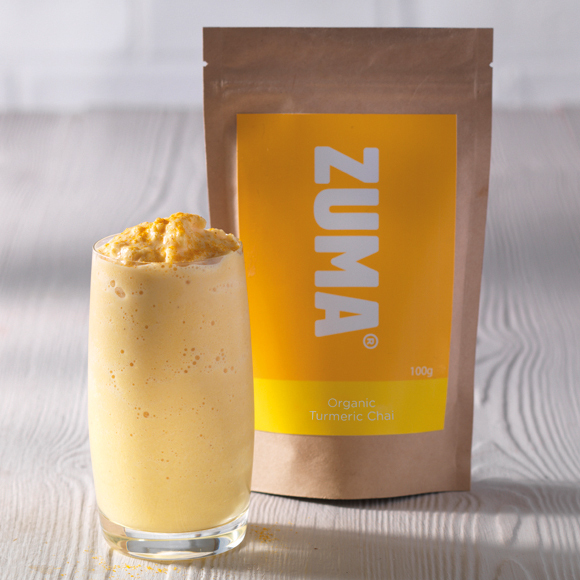 Capturing the emerging turmeric trend set to take the industry by storm this season, the first product to launch for autumn/winter 2017 is Zuma Organic Turmeric Chai. We have mixed pure turmeric with subtle flavours of ginger, vanilla and orange for the perfect winter warmer. The yellow of the root makes for an impressive bright blend whether used hot or cold. Serve as a latte, white hot chocolate or simply as an early morning shot mixed with espresso. Approved by The Vegan Society it tastes wonderful with coconut milk, as well as regular dairy for a delicious golden drink. Available in the next few weeks. We will also be introducing a new Hot Chocolate. Direct is a 25% cocoa blend that focuses on ethically sourced ingredients and is the result of our partnership with the Naranjillo cooperative in Tingo Maria, Peru. 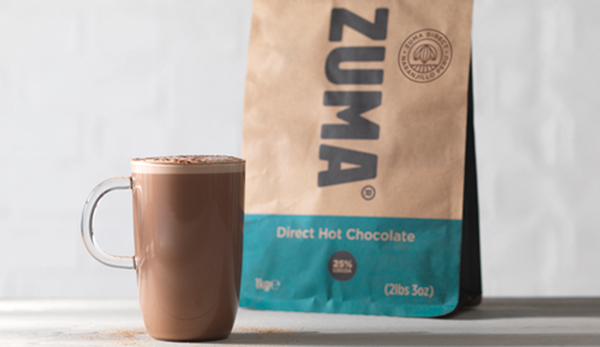 From this partnership we have previously created a pure 100% Cocoa which baristas can mix to their own blend of hot chocolate by adding Zuma Organic Sugar. The non-alkalised process used for the cocoa, gives it a distinctive warm reddish tone with an unadulterated and complex taste. A combination of nothing but cocoa and sugar, Zuma Direct is free from anything artificial and approved by The Vegan Society. Available in 1kg re-sealable flat bottomed bags, this particular blend offers your customers a lighter 25% cocoa content with the same delicious pure Peruvian cocoa as our 40% Zuma Organic Hot Chocolate. Available from October. Adding to our extensive array of Sweetbird syrups, we are expanding the Sugar-free range with a Sugar-free Gingerbread addition. With the same delicious taste as Sweetbird original Gingerbread Syrup, it is made with natural ginger and cinnamon flavours and is free from artificial colours and high fructose corn syrup. At only 92 calories for a 12oz latte made with skimmed milk, this innovative product allows your customers to consume their favourite drink with fewer calories. Available in the next few weeks. Our winter releases will also include 2 delicious new toppings helping you to finish your drinks with fun and flair. 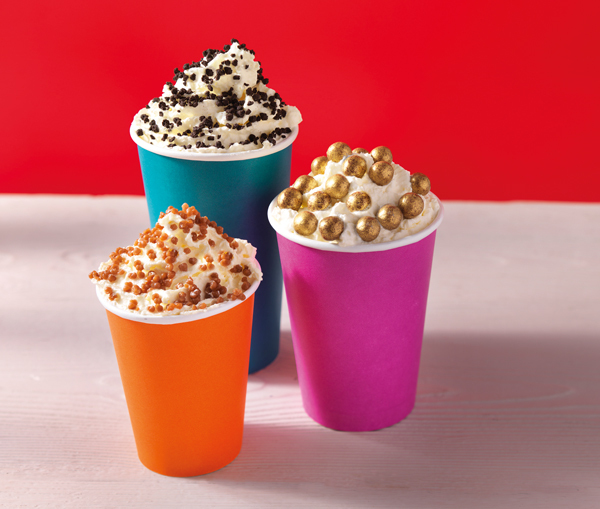 Toffee Crunch and Golden Balls will join the three other options in the range, Mini Rainbow Beans, Cookie Crumb and Triple Chocolate Crispies. Available in the next few weeks. Winter wouldn’t be complete without our double walled festive cups. 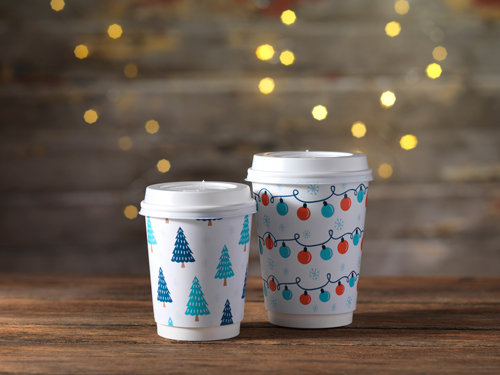 Available in two unique limited edition designs, the cups come in an 8oz Festive Forrest Tree print or a Bouncing Baubles 12oz option. The perfect finishing touch to all those seasonal specials. Get them before now they are gone.